RAUSCEDO, Italy – Season after season, he’d been growing and harvesting the same grapes on the same land. But five years ago, Livio Salvador began to wonder whether something was changing. When he walked through his vineyards, he would see patches of grapes that were browned and desiccated. The damage tended to appear on the outside of the bunch – the part most exposed to sunlight. Salvador talked to other growers and winemakers in the region, and they were noticing it, too. In a region celebrated for the prosecco and pinot grigio it ships around the world, Italy’s particularly sensitive white wine grapes have become a telltale of even gradual temperature increases – a climate slipping from ideal to nearly ideal. Vintners and farmers are noticing more disease, an accelerated ripening process, and, most viscerally, a surge in the number of grapes that are singed by the intensifying summer heat. But they debate whether the treasured aromas and flavor notes of their wines are already changing – and whether they’ll one day lose out to colder-climate producers whose wines once were scoffed at. Climate change is only beginning to reorder the global wine industry, altering the patterns of how and where grapes are produced, and testing whether the world’s iconic regions can find ways to adapt. Many factors influence wine and its taste. Yet because of rising temperatures, some of Europe’s biggest producers are buying up land in the Pyrenees foothills, in northern China, and in southern England – where the climate now resembles the French Champagne region of the 1970s. If the planet’s climate warms in coming decades as much as most scientists predict, there will be more pressing concerns than whether “you’ll have a good Bordeaux from Bordeaux,” Wolkovich said. But for growers – and for wine drinkers – the changes are nonetheless imperiling. Some vintners in Italy remain reluctant to talk about the changing climate, because the commercial identity and value of their wines is based on an established terroir – the soil and environmental conditions that help build a grape’s flavor. But Salvador is among the increasing number of growers who feel the changes are undeniable. Hotter summers are shortening the growing seasons. The grapes are more quickly developing sugar, which ferments into alcohol. Those grapes aren’t building the same acidity. Prosecco is supposed to be floral, fresh, and low in alcohol. The environment is pushing that wine in the opposite direction – something vintners are trying to fight off with technological adaptations. So one recent Saturday, Salvador drove to the region’s annual wine festival where, this year, an event had been added to the schedule: a conference on the wine industry and climate change. More than 250 people filed in, a mix of wine executives in suits and farmers in jeans who filled every seat. The next speaker, Diego Tomasi, was a researcher at an agricultural institute partly funded by the government. Earlier in his career, Tomasi co-wrote a book comparing 19 microclimates within a small zone of northern Italy, describing how even minute changes could alter a wine’s taste. But now, at 58, he has dedicated himself to the more significant changes that are happening. He cued up a slideshow that tried to capture what he has been seeing. Then, Tomasi showed the photos of the sunburns – grapes that were shriveled, darkened. Sometimes, even the leaves showed a reddish char. Tomasi said he first noticed the burns 15 years ago. Now, they are commonplace. He said the burns were “certainly” climate-change related. Some wine experts say regions might eventually have to consider using different grape varietals – something that would force companies to alter their identities. But for now, growers have been more interested in pushing for ways to maintain the health of what they’ve been using for decades. At least one major northern Italian winemaker, Tomasi said, has moved its vineyard into a higher elevation. 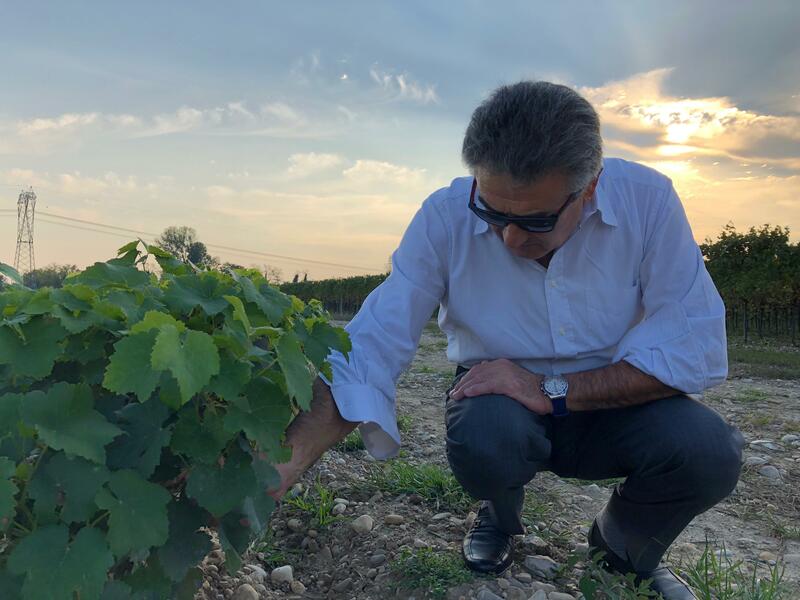 Another, Villa Sandi in Crocetta del Montello, has been performing experiments to find a more water-efficient rootstock, the company’s enologist, Stefano Gava, said. And at Pitars, a family-owned vineyard in San Martino al Tagliamento, workers have installed hundreds of miles of plastic irrigation piping beneath the soil – meaning water is released underground, closer to the roots and in cooler temperatures, and less is lost to evaporation. But one of the most common issues has been preventing the burns, which leave the grapes without moisture – and useless for wine. Some growers are trying to keep their vineyards leafy as a way to provide as much shade as possible. Others, like Pitars, have opted for a more counterintuitive strategy – cutting away leaves early in the season. This step, they say, helps the young grapes grow accustomed to the heat and develop a thicker skin. “We’ll try this new method in 2019,” Salvador said. Salvador himself doesn’t make wine. Instead, at harvest time, he sells his grapes to Pitars, because, he said, owner Paolo Pittaro “is better at this than us.” He also consults with Pitars on when to harvest. Published: Oct. 28, 2018, 4:20 p.m.